Apologies. Sincere and heartfelt apologies. Want to hear something stupid? One of the reasons that I have not been posting as much is because my computer is no longer on the same floor as my kitchen. I have to walk down a whole 14 stairs to get to the room where I write. What I realize now is that in Seattle, my blogging was usually done piecemeal over the course of a day or two. I would stir something on the stove and run into the study and type a few sentences. While waiting for the school bus to bring Graham home, I would type a few sentences. While on hold with the cable company, I would type a few sentences. Writing was a part of the daily rhythm of my life. Now our set up has changed and while I can wrap my brain around the fact that my kitchen is smaller and laid out very differently, and the fact that my kids’ bedrooms are on a different floor than ours, and that I’m living in freaking California – I can’t get back in the swing of the blog post. 14 stairs. Hmph. I should also say that I am less busy in Oakland than I was in Seattle. I had to say goodbye to my cooking classes (see smaller kitchen: above), and my job at Book Larder, and now both my kids are in school full time. For some people that would mean putting more time into a food blog. But the more I have to do, the better and more efficient I am at doing it. If I have time on my hands, I can be good at wasting it. Salted Caramel Ice Cream. Maybe you think the whole salted caramel thing is overblown! overdone! trendy! I’m here to tell you it none of those things. Caramel on its own is amazing, one of my very favorite things in the world. Those little Kraft squares? I still love those things even though they have a plastic-y waxy coating and they can be hard to swallow. I will admit that there is no subtlety in those squares, they are really just sweet. Real caramel has much more depth. Some smoke and, if you are not afraid, a healthy dose of salt. I love pricey fancy wrapped salted caramel squares, I love them with robes of bittersweet chocolate and even more salt on top. But I do think that salted caramel ice cream is the best place to appreciate this amazing flavor. This recipe comes from the folks at Bi-Rite Creamery and their terrific book Sweet Cream and Sugar Cones. When I saw this book, I might have scoffed. I have The Perfect Scoop and Jeni’s Homemade Ice Cream – why do I need a third ice cream book? There are, as it turns out, many reasons. Like recipes for ice cream cakes and homemade graham crackers, and if nothing else, this salted caramel ice cream. I have made others. This one is the best. The directions are a little fussy. If you are new to ice cream making, this is a nice and precise way of doing it with little room for error. I will give you the recipe as written but I took some shortcuts because I have made caramel and ice cream many times before. Sometimes when I am cooking or baking, I will suddenly get a big wallop of nostalgia. A smell or taste or even the feel of an ingredient will take me back to my childhood. That happened to me when I made these milk shakes. My mom made us malteds when I was a kid and the smell of any blender working reminds me of those malteds. In this case, it was not only the smell but the taste. I love malted milk and so do the guys at the Baked bakery, bless them. Their new book highlights their ten favorite ingredients or flavors and malt is one of them. The beauty of these milkshakes is that you are basically just putting things in a blender and turning it on but they taste like everything is homemade. I would say it is important to use super high quality ice cream, but I just used Dryer’s (did you know the headquarters is in Oakland?) and they were superb. Set the cream by the stove so it’s at hand when you need it. Measure out ½ cup of the sugar and set near the stove; you’ll use this for the caramel (the rest will go in the with the yolks). Put 2 tablespoons of the sugar for the caramel in a heavy nonreactive saucepan over medium-high heat. When the sugar is melted around the edges and starts to turn amber in places (about 2 minutes), stir the mixture gently and add another 2 tablespoons sugar to the pan. Continue to add what remains of the ½ cup of sugar 2 tablespoons at a time, stirring frequently and allowing most of the sugar to melt before you add more. Watch carefully as the sugar darkens, stirring gently to help it melt evenly. When the caramel has become a dark mahogany color, remove the pan from the heat and immediately but slowly pour the cream into the pan. (The mixture will steam and bubble up, so wear oven mitts and be very careful to avoid splatters and steam burns.) 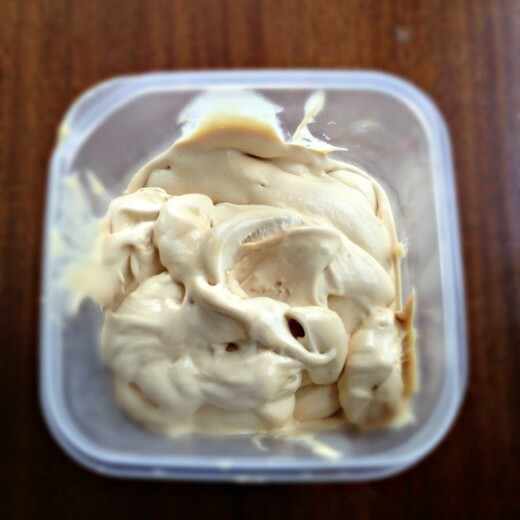 When the bubbling subsides, gently stir to completely blend the cream into the caramel. If you have lumps of hardened caramel in your pan, simply put the pan over low heat and stir until the caramel is melted. Once the caramel is completely smooth, stir i the milk along with the salt and pt the pan over medium-high heat. When the mixture approaches a bare simmer, reduce the heat to medium. In a medium heatproof bowl, whisk the yolk just to break them up, then whisk in the remaining ¼ cup of sugar. Set aside. Careful scoop out about ½ cup of the hot cream mixture and, whisking the eggs constantly, add the cream to the bowl with the egg yolks. Repeat, adding another ½ cup of the hot cream to the bowl with the yolks. Using a heatproof rubber spatula, stir the cream in the saucepan as you slowly pour the egg and cream mixture from the bowl into the pan. When the base is completely chilled, freeze in your ice cream machine according to the manufacturer’s instructions. While the ice cream is churning, put the container you’ll use to store the ice cream in the freezer. Enjoy right away or, for a firmer ice cream, transfer to the chilled container and freeze for at least 4 hours. Freeze 2 large (12-ounce or larger) or 6 small (4-ounce) glasses for at least 30 inutes. 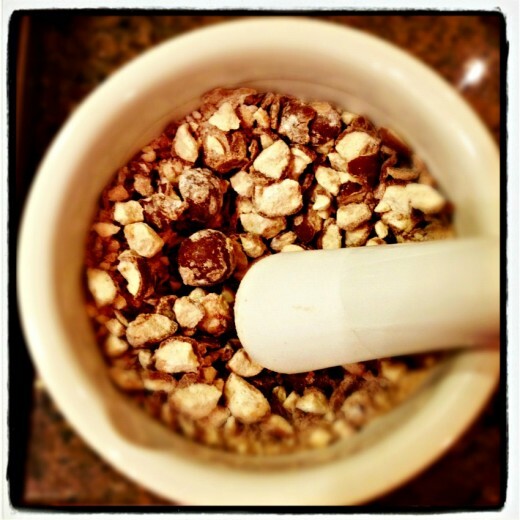 Crush the malted milk balls with a mortar and pestle until they are a chunks powder. Pour the milk into a blender. Cut the vanilla bean in half lengthwise and, using the tip of a knife or a small spoon, scrape the seeds into the milk. Discard the vanilla bean pod or reserve it for another use. Cover and blend for about 15 seconds. Add 2¼ cups of the ice cream and the malted milk powder and blend until thick and creamy. A good milk shake should be eaten with a spoon – so if the milk shake seems too thin, add another ¼ to ½ cup ice cream and blend again. 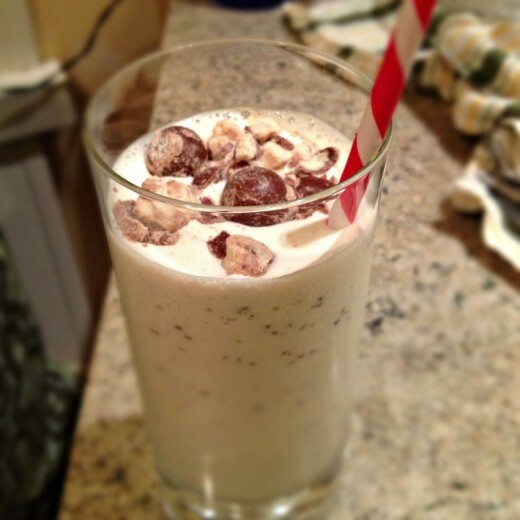 Divide the shake between the chilled glasses, garnish with the crushed malted milk balls, and serve immediately. Yum! I haven’t bought an ice cream maker but this might send me over the edge. It sounds right up my alley. And we’re big malt fans, too. I’ve made the salted caramel ice cream from Jeni’s book (and, as it happens, have actually been on a short streak of posts about ice cream on my own blog), but this looks delicious as well — you can’t go wrong with Bi-Rite! And I agree with you that caramel seems most at home in ice cream. I’m going to say something really sacrilegious right now…and it is that I’ve made the pumpkin pie ice cream from Bi-Rites book and it was NOT good. Weird texture…made your tongue taste fuzzy. But…I LOVE Bi-Rite with all my heart and soul. So I’m going to give it another chance and make this ice cream!! Also, I’m SO glad you’re back!! I was missing you dearly. Those 14 steps are SO worth it!!! So glad to see your back! I definitely do as you do and when I’ve got less on my plate, tend to waste time rather than take advantage of all my free time. And then I feel immense guilt because it seems like I’ve got nothing going on! Yet when I’m super busy there seem to be a million and one things I want to do but don’t have the time to… when will I learn? I’m confident you’ll find your spot in Oakland and a way to make things work for you, Dana. I hope you take us along on your journey- I never tire of reading your writing :). Also- I’m pretty sure our Halloween candy hung around for several months… yikes, maybe that was not a good thing! I have the same issue with getting a lot more done when I’m busy and wasting a lot of time when I’m not. It’s weird. I’ve tried writing to-do lists to make myself feel busier during a slow week. I have to say, salted caramel ice cream might be the very best thing in the world. I’ve made Ina’s recipe which was delicious but didn’t freeze well at all. I have to try this version next! It’s cold outside here, and yet now I’m craving some ice cream and a good milkshake! Salted caramel ice cream …sounds so, so delightful. I have batch number 2 of the Salted Caramel Ice Cream chilling in the fridge. Taking it to Thanksgiving dinner, along with your fabulous fall salad, to dinner with Alex, John, Toni and their group.